In this age and time, there is no doubt that devices are becoming smaller each time a new model is released. That is because people, especially outdoor activity enthusiasts, prefer items that they can easily carry and those that will not take too much space in their bags. Fishing is amongst the activities wherein you need to carry a lot of items, and the introduction of fish finders has added more needed stuff to carry. Fortunately, these devices do not come in bulky and heavyweight designs, so that is not really much of a problem. That said, when you purchase a fish finder, you must make sure that it is integrated with features and technology that will make your fishing activity a great success. As such, we have looked into the Garmin 010-01550-00 Striker 4 Fish Finder to see if it’s worthy to buy or not. Garmin International Inc. is a company that is known for manufacturing innovative devices for sports, fitness, health, aviation, and more. The Strike 4 fish finder is one of their products that belong to the mid-range price while still equipped with the latest technology. CLEARVÜ Scanning Sonar Technology: This new technology is responsible for producing incredibly detailed representations of all solid objects in the water and around your kayak. Interface: The interface has been kept simple with a few dedicated buttons alongside the main selector switch, making it possible for novice fishers to learn how to use it quickly. IPX7 Waterproof Rating: With a somewhat high waterproof rating, the unit can be fully submerged up to one meter for a maximum of 30 minutes without any harm to the device. Waypoint Mapping: This system allows the user to easily mark and navigate obstacles with a maximum freshwater depth of 1,600 feet and a saltwater depth of 750 feet. Additionally, the unit can store up to 5,000 unique waypoint map readings. Built-in Flasher: Equipped with a classic flasher, the device is great for ice fishing or vertical jigging. 3.5” LCD HGVA Backlit Screen: The fish finder has a sufficient screen size that allows you to read the data clearly, even in low-light conditions. Sonar Capabilities: Works well in two different frequencies, which are 50 and 200 kHz, as well as two beams, namely 77 and 200 kHz. A-scope: Having an A-scope system, this unit can display fishes passing through the transducer’s signal in real time. Portability: Coming in at a size of 3.6” x 1.6” x 5.9” and weight of eight ounces, this unit will comfortably fit into your kayak without compromising your available space. Transducer Cable: The product’s transducer cable has a length of 20 inches (6m), which allows it to float at a relative distance from your boat or kayak. GPS: Garmin made sure that the GPS technology integrated is highly sensitive so that it can assist you in marking your spots accurately. The Garmin Striker 4 offers a wealth of features that’ll boost the effectiveness of any fishing trip. Users will easily be able to map their environment whether they’re in fresh or saltwater with depths of up to 1,600 and 750 feet, respectively. Combine that with the CLEARVÜ Sonar system, and you’ll have an incredibly clear picture of your fishing spot. One of the greatest benefits of the Garmin Striker 4 is its simplicity; this model is intuitively designed with as few buttons as necessary and clearly displays the readout on its 3.5”, 480×320 resolution LCD screen. Although the device does not have pre-installed maps, you would be able to save a lot of waypoint maps without hassles. To add more, the GPS technology integrated is way too sensitive, which assures you that you won’t be missing out those waypoints when you go fishing again. All of these features and squeezed into the unit’s compact and lightweight construction, making it extremely portable as well as practical. For those looking to stick with a brand they both know and trust as well as having a bit more in their budget might want to consider the Garmin Striker Plus 7SV. Users will first notice the seven inches screen with an improved resolution of 800×480, which allows it to produce clearer and easier-to-distinguish images. This unit also pairs with the ActiveCaptain app for even greater functionality as you’ll receive smart notifications as well as have access to Quickdraw Contours mapping software. You’ll be glad to know that Garmin has kept to their minimalist interface allowing for another extremely user-friendly model. On the contrary, if you’re looking for something similar to the Garmin Striker 4 but want to try something new, then the Lowrance Hook-2 is a great alternative. It has a slightly larger display than the Garmin Striker 4 and offers three different sonar options and even a choice of the mapping and waypoint models. This unit is incredibly easy to install as there is no need to spend hours fine tuning your sonar as Lowrance were kind enough to incorporate an auto-tuning setting that helps create more visible fish arches but still keeps clarity and target separation high. When it comes to compact and affordable fish finders that offer all of the necessary features required for an enjoyable fishing trip, you’ll be hard-pressed to find a better solution than the Garmin Striker 4. The upper limits of what you’re able to spend on more advanced sonar or navigation capabilities easily run into the thousands but are built for professional or commercial use. 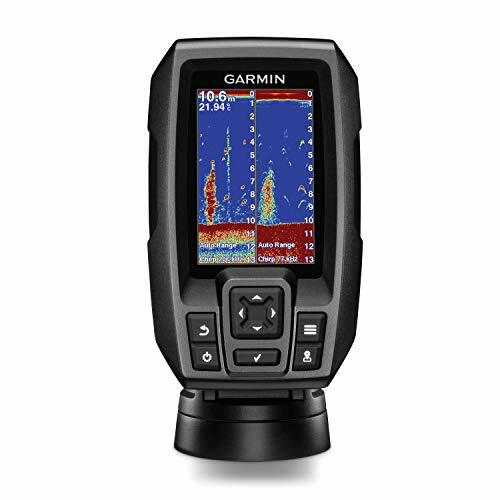 The Garmin Striker 4 is great for recreational fishing enthusiasts who are looking to increase the effectiveness of their trips without a huge price tag. With a handful of useful features that are packaged into an incredibly user-friendly device at an entry-level price, learning how to incorporate a fish finder in your fishing activities won’t be too challenging.